Demanding Feet Get Unsurpassed Comfort and Fit in Orthofeet Gramercy Men's Lace-Up Orthotic Shoes. 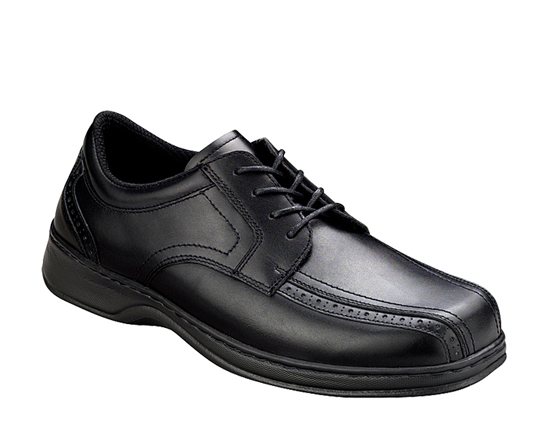 Orthofeet Lace shoes are crafted with advanced athletic and therapeutic shoe detailing to offer relief for heel-pain, arch-pain and forefoot discomfort along with unsurpassed comfort and protection for sensitive feet such as diabetic or arthritic feet. Additionally, the shoes are crafted with advanced athletic & therapeutic shoe detailing to offer relief for foot discomfort and heel pain, and provide unsurpassed comfort and protection for sensitive feet such as diabetic or arthritic feet. Unique orthotic support, seamless lining, extra room and Ergonomic StrideTM sole make every step you take soothing with comfort. Comfortable for the whole day. True to size specified. Good value. Good but ugly Much uglier than in picture. I bought it to wear with my suit but that is not possible. Good for Asia Wear. Very comfy. At Last I have plantar fasciitis and my heal is very tender when I walk a lot, even with my doctors inserts in place. I purchased this shoe to try based on the recommendation that it was recommended for sufferers of plantar fasciitis. I was pleasantly surprised that I could join my wife walking three miles for excerise without my insert and not experience the heal pain. I bought this style for casual dress but find myself wearing them anytime I need to walk for more than 30 minutes continuously. My husband has a very hard time finding shoes that fit, look good, and take care of his feet. These do. Thank you.